The midfielder will return to Easter Road, where he enjoyed a successful loan spell. Hibernian have signed Celtic midfielder Scott Allan on a pre-contract deal to join Neil Lennon's side this summer. Allan is in the last six months of his contract at Celtic, where he has failed to make the breakthrough into the first team. 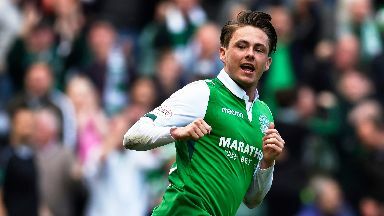 Amid speculation about his future, he has now committed to returning to Easter Road when he becomes a free agent at the end of the season. For the midfielder it means a return to the club where he has enjoyed some of the best football of his career. He signed for Hibs in 2014 after being released by West Bromwich Albion and his performances persuaded Celtic to take him to Glasgow on a four-year deal. He then returned to the Edinburgh side last season on loan and once again impressed. Lennon said: "It's no secret that Scott is a player I admire and wanted back at Hibernian. "He's a player who suits the attacking brand of football we like to play. The type that gets supporters off their seats. "We're looking forward to having him back." Chief executive Leeann Dempster told Hibs' official website: "We're delighted to have been able to come to a pre-contract agreement with Scott. "It goes without saying that he's a player our supporters hold in the highest regard and we were determined to bring him back to Easter Road. "It's an arena and a club that brings out the best in Scott and, from speaking to him, it's clear that it means a lot to him."